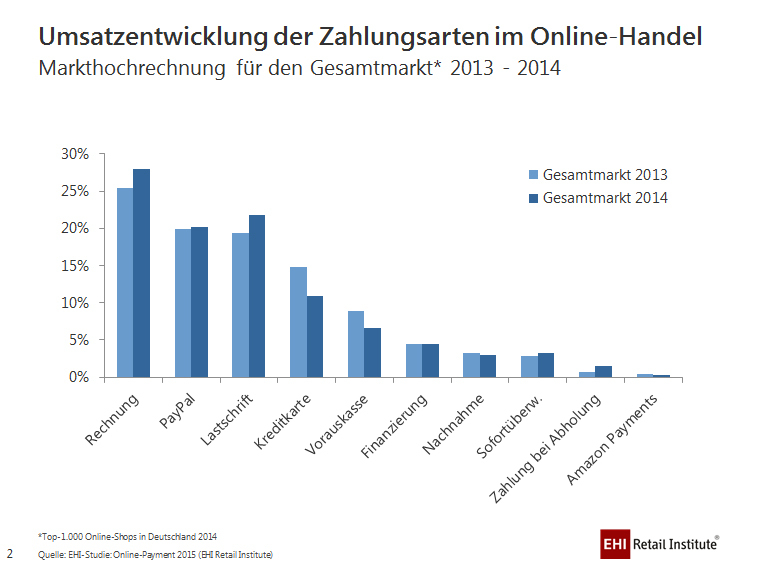 Concerning E-Commerce payment behaviour in Germany today we have a closer look at the 2014 EHI Retail Institute numbers. German E-commerce buyers prefer payment upon invoice since many years. This is no news. 28% of E-Commece Revenue is payed after delivery by bank transfer. This might be secure and cash saving for buyers but expensive for merchants. Invoice is by far more expensive if you include direct and indirect costs as debtor management and default. IBI Research has calculated more than € 8 per transaction (Source: Total costs of payment methods 2014). The real news is that direct debit is growing fastest with 13% (or 2.5% points) to 22% overtaking PayPal (20%). Direct debit is now no 2 preferred payment method in E-Commerce. This is great for merchants because direct debit is cheapest payment method after Sofort Überweisung. IBI calculates under € 2 per transaction for Sofort and € 4.41 for direct debit. With SEPAone we think we can lower these costs to a level around € 2.50 for small merchants, undercutting credit cards and PayPal by far. But why is direct debit rising now? There is no marketing campaign for direct debit. One argument discussed at the EHI Card Congress in Bonn last week was that regulatory uncertainty around SEPA is now over and merchants now invest in optimizing their payment portfolio. This sounds plausible to me. The number of top 1000 merchant, offering direct debit, increased 2014 compared to 2013. Another strong effect might be the Amazon effect. Amazon uses direct debit as their main payment method and Amazon revenue is waited strongly in the top 1000 E-Commerce EHI numbers. So let’s do it like Amazon and offer direct debit to our buyers. ← Will SecuRe Pay, MaSI and PSD 2 stop us from pulling Online Direct Debits?